African ringneck and Indian ringneck parrots are both excellent talkers; they usually begin speaking between 8 and 12 months of age. Although commonly confused, a number of differences exist between these parrots. Indian ringnecks are often referred to as sentinels, since they will shriek loudly to warn each other of impending danger. African ringnecks are much quieter birds; they produce substantially less noise. Indian and African ringnecks are close cousins, subspecies of Psittacula krameri. The Indian ringneck species is P. krameri manillensis and the African ringneck as P. krameri krameri. Size, personality and color make these cousins distinguishable and unique from one another. African ringnecks are affectionate. They enjoy spending time with their owners, even taking showers. Handle and interact with your African ringneck on a daily basis to keep him tame. Indian ringnecks, on the other hand, are not affectionate birds, although they can make loyal companions. While it's important that you handle them frequently, they can develop social anxiety if they spend too much time with people. One of the obvious differences between the African ringneck and the Indian ringneck is area of origin. African ringnecks are natives of Africa. They can be found throughout the entire continent in flocks of up to 25 birds. They prefer warm climates and enjoy roosting in palm trees. During mating season, they split into pairs and build nests to raise their young. Females care for the young while the males feed and protect their families. Indian ringnecks are most commonly found in Pakistan and India, although flocks have been introduced to England and the United States. While they prefer living in forests, they have no problem frequenting urban areas and feasting at bird feeders. Indian and African ringnecks look remarkably similar. Close observation will reveal several key differences. 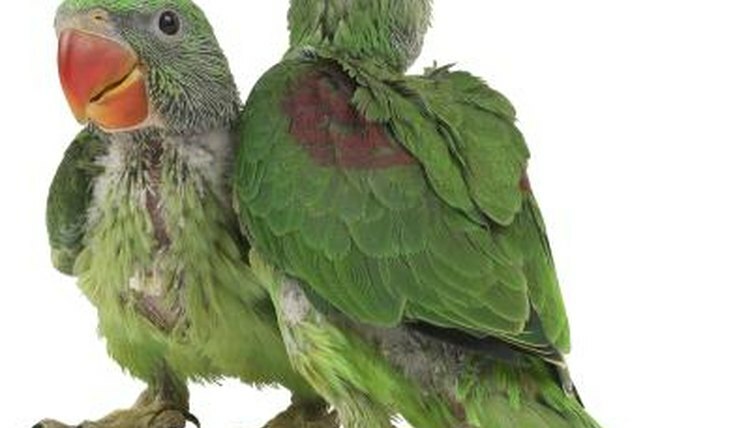 Indian ringnecks are lime-green in color. They have a blue tail, bright red beak and yellow or black eyes. The feathers under their wings and tails are yellow and can be seen only during flight. Indian ringnecks average 16 inches in length and weigh between 120 to 125 grams. African ringnecks are petite birds, weighing 110 to 120 grams. They average 11 to 13 inches but can be as small as 9 inches in length. Their bodies are bright green and their beaks are purple. While both species have black rings around their necks, the ring is much more prominent in the African ringneck. Indian ringnecks are more popular as pets. This is partially due to the fact that they are available in a greater variety of color mutations. While the standard color is green, Indian ringnecks can be found in solid blue, yellow, white or gray. African ringnecks are primarily bright green, although in rare instances they can be blue. Although Indian ringnecks are one of the most aggressive parrots, they are desirable as pets due to their bright colors and fun personalities. Plenty of attention and proper training can turn Indian ringnecks into pleasant avian companions. They require patient training, positive reinforcement and frequent handling. Even though African ringnecks are extremely docile, they are rare in the United States.